Salt: we use it to heighten flavours and make food taste good, to preserve flavours and make food last for a later date, to keep our roads clear in wintertime, to replenish our electrolytes on a hot summer day, and a whole host of other agricultural and manufacturing uses that might surprise you (like making paper!). For all the many ways that I interact with salt everyday – knowingly or unknowingly – I have never thought too much about how salt is produced or where it comes from. I certainly didn’t know that the largest salt mine in the world is in Goderich, Ontario, just a few hours from my hometown. 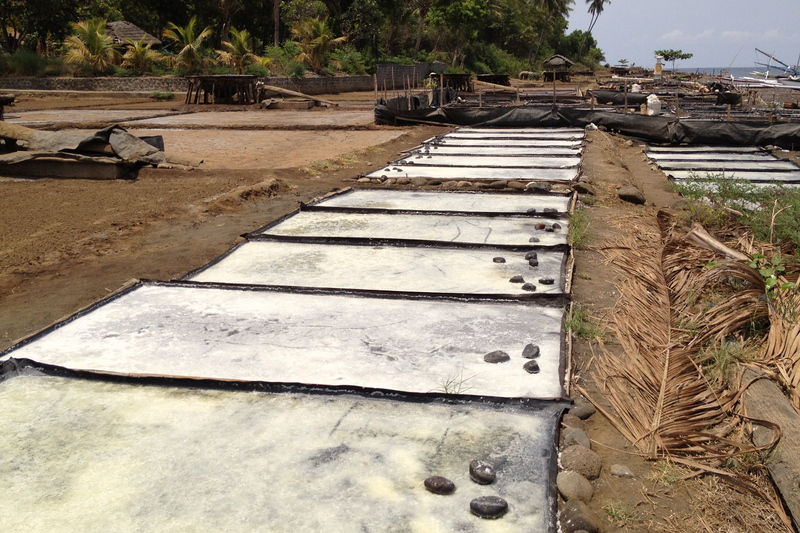 A recent trip to a sea salt farm in Bali, Indonesia offered a wonderfully insightful look at sea salt production. Salt comes from one of two sources: the salty water of our seas and oceans (and occasionally lakes, like Great Salt Lake in Utah) or from ancient seabeds that evaporated long ago leaving behind large salt deposits. To access the prehistoric underground salt sediments, the salt can be mined by either chipping it into pieces small enough to bring to the surface and then process into rock salt, or by using water to form a saline solution that can be pumped to the surface and used to create evaporated salt. When the source is the sea or the ocean, the salt crystals are extracted by the power of the sun and wind to create solar salt, better known as sea salt. There are many kinds of sea salt, depending on where it comes from, some more famous (and pricy) than others. Along the east coast of Bali, with shades of brown, amber, and beige and no green in sight, the sun pours down and the dry season is dry. While these conditions cannot support Bali’s famed lush rice paddies, they can provide a unique combination of sea and sun that allows for the production of salt. The coastal area around the base of Gunung Agung, Bali’s largest active volcano, are home to much of Bali’s salt farming. Drawing upon 900 years of history, many farms still use traditional farming techniques. 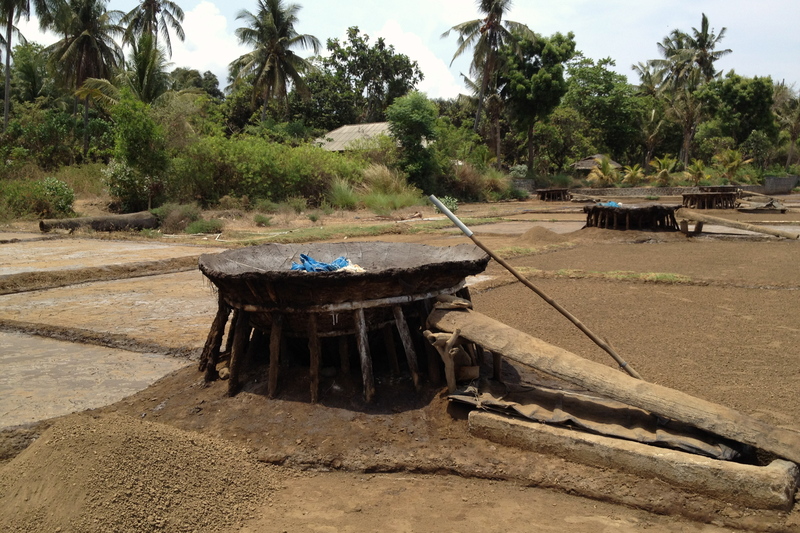 The whole process can take up to two weeks with lots of hand raking, sieving, and panning along the way. Starting early, as the sun begins to share its warmth, the salty seawater is brought in from the coast and poured out over flat sections of sandy earth. 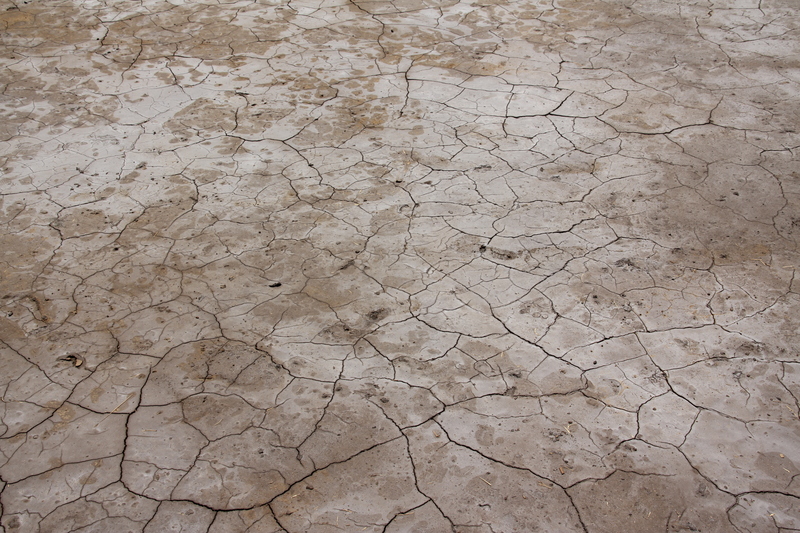 Once the water has evaporated, the earth is raked and transferred into large woven sieves. Water is added and the sand is filtered to create a concentrated salty solution. From here, the salty water moves to flat, open drying beds, where, with the help of the scorching sun and the sea breeze, salt crystals ultimately form. 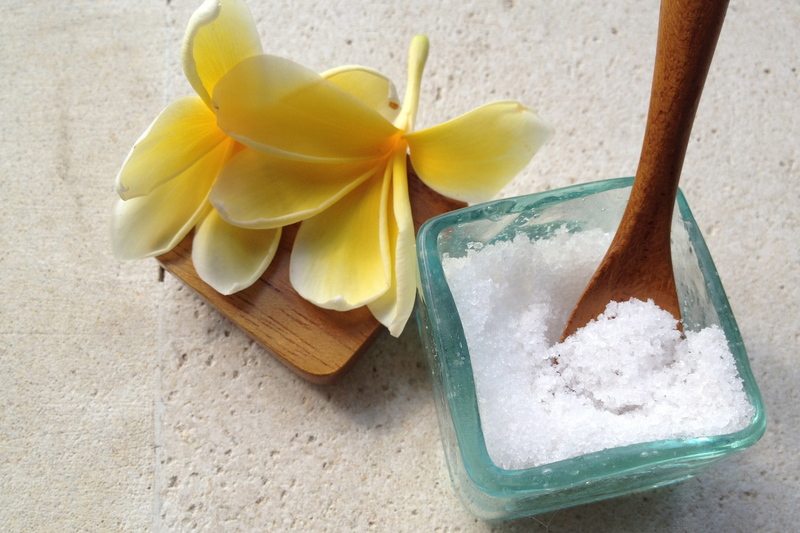 The salt crystals will be ground, to create a fine salt, or left as larger crystals, known as Balinese pyramid sea salt. The hollow pyramid crystal seems to be specific to salt from Bali, with the unique shape and texture attributed to the chemistry of the water along the east coast where the warm water from the Lombok Straight meets the cooler water from the north. While exotic salts are filling the shelves at gourmet food shops, there is a practical side to salt that is about more than just taste. Most table salt contains a variety of additives designed to help address health concerns. Exactly what is added to your salt varies, depending on the rules set forth by your government health agency. In Canada, iodine is added to address iodine deficiency, which can cause thyroid problems, including goiters. In some countries fluoride is added, as is iron. With fluoridated water and toothpaste both common in Canada, you’re not likely to find fluoride in your salt. But if you are buying Windsor brand table salt, Canada’s largest table salt producer, you will find ‘inverted sugar syrup’ has been added. Although it seems contradictory to add sugar to salt, the sugar helps keep the iodine from evaporating. 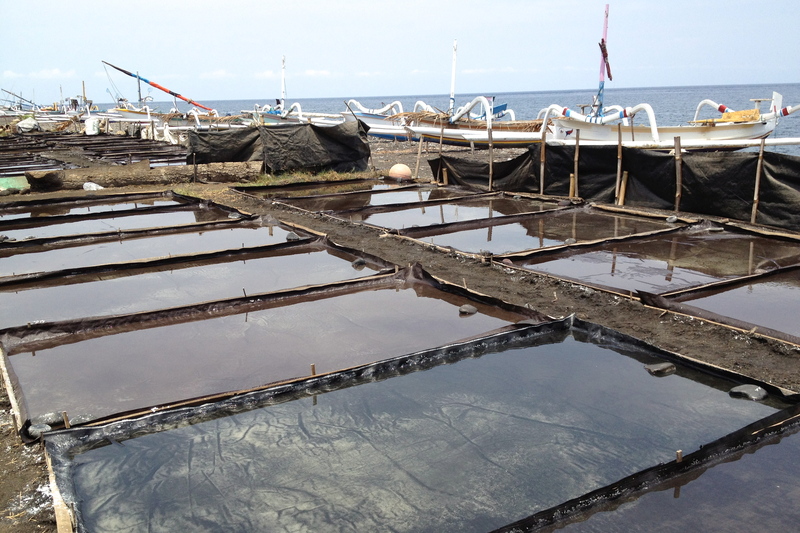 According to the International Council for Control of Iodine Deficiency Disorders (ICCIDD, now that’s a mouthful), small-scale farms produce 80% of Indonesia’s salt, known as the people’s salt. It is less expensive and has its own channels for sale and distribution. It is also of a lower quality and is not suitable for iodization. 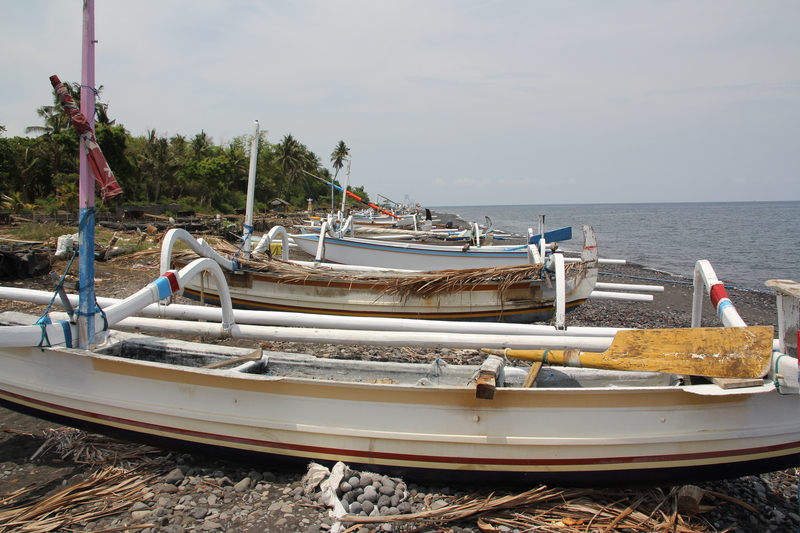 Many programs have ben put in place to try to combat the issue, but in the poorer regions of east Bali, iodine deficiencies are still a concern. I can now appreciate that salt, like wine, has a terroir. The seawater, the sun, and the wind of a particular area all contribute to the colour, the shape, the texture and, most importantly, the flavour of the salt. Only along the parched eastern coastline, where the dry season is that little bit longer, the sun perhaps that little bit stronger, can Balinese sea salt be created.